It isn't the prevailing opinion, but I was not enamoured with the debut from Broken Bells. Therefore, I wasn't expecting too much when I popped in the new EP from Danger Mouse and The Shins' James Mercer, Meyrin Fields. I was very pleasantly surprised by what I heard though. My main criticism of the full length was that I found it too sterile and suffered from being too inorganic. The harmonica and loose bassline of the title track blew that out of the water from the very beginning of the EP. The rising and falling cadence of "Windows" makes that track nearly hypnotic. Mercer's vocals are crisper and more prominent on the EP as well. It certainly helps that the singing is more distinct on a song like "An Easy Life", rather than being masked by a curtain of electronic nonsense. The fuzz-filled "Heartless Empire" provides a suitable conclusion to the record. 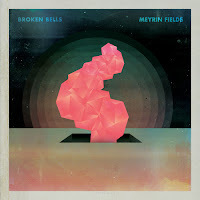 Meyrin Fields is the album that Broken Bells should have made as a debut, at least in my mind anyway. It definitely makes me eager to see where they go from here. Best tracks: ""Windows", "Meyrin Fields"